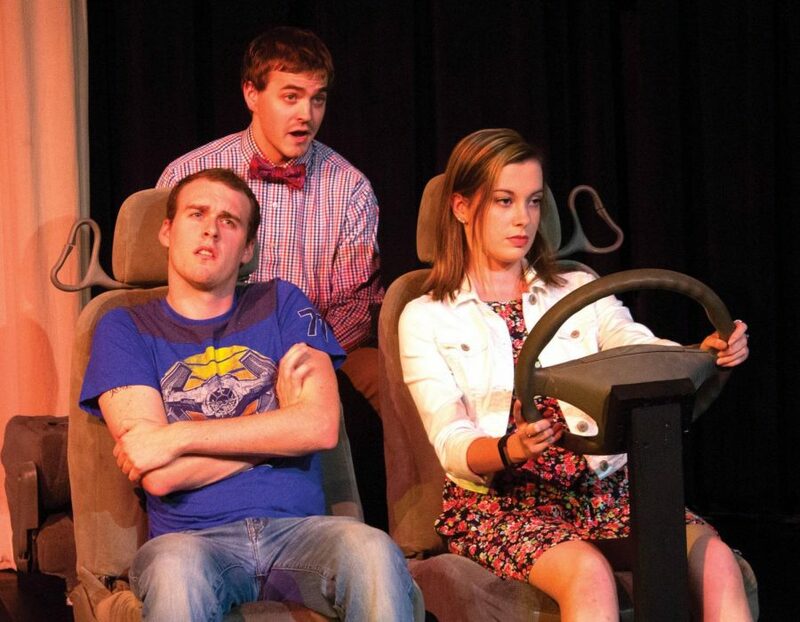 Graduate student Nathan Selove writes, directs and narrates the play "Aut is Love." The play centers around the romance between Selove (Austen Carnahan) and his wife (Erin Hassenstab), both of whom are on the autism spectrum. This past weekend, the play “Aut is Love” was performed three times in the Interpreter’s Theater in Lang Hall. The play was written and directed by Nathan Selove, serving as his master’s thesis. Selove also acted as the narrator in the play. There are three main characters in the play: past Nathan (portrayed by Austen Carnahan), Nathan’s now-wife Jess (portrayed by Erin Hassenstab) and present-day Nathan (portrayed by himself) who narrates the play. Tim Matheson played a variety of roles, including Nathan’s dad, a therapist and a cashier. The play begins with Nathan and Jess meeting for the first time. The couple experiences milestones in their relationship like saying the first “I love you” and getting married at the play’s end (which happened in May 2018). “Not absolutely everything is word-for-word, but it’s all based on true events that happened, true conversations that happened,” Selove said. Present-day Nathan reacts to things he said in the past, often by cringing or face-palming on stage. Nathan and Jess experience highs and lows like any other couple. Some of those challenges are small, like being bothered by the other’s use of incorrect grammar. Other challenges are much bigger, like their decision to move from Virginia to Iowa together. The play ends with a call to action. It took Selove about a year to write the play. He started by writing a few scenes for a class. Selove takes issue with the fact that many media portrayals of autistics are only researched by talking to professional psychologists without ever reaching out to actual autistics. One portrayal that Nathan thinks was accurate was the movie “Mozart and Whale,” which he watched as a child. Nathan also thinks that Sheldon in “The Big Bang Theory” and Dr. Temperance Brennan in “Bones” are two accurate depictions of autistics, even though they are not identified as such. When it came time for auditions, Selove decided against disability-specific casting. He didn’t think it was necessary to only cast autistics as autistics since whatever actors he chose would have access to a real-life autistic. Selove plans to upload a recording of his play to his YouTube channel (Nathan Selove) where he wants to continue to advocate for the autism community. He also would like to send his script to a publishing company. “I think that a comedic portrayal of an autistic relationship is going to help both autistics understand that such a thing is possible and neurotypicals understand that such a thing should not be scoffed at,” Selove said.